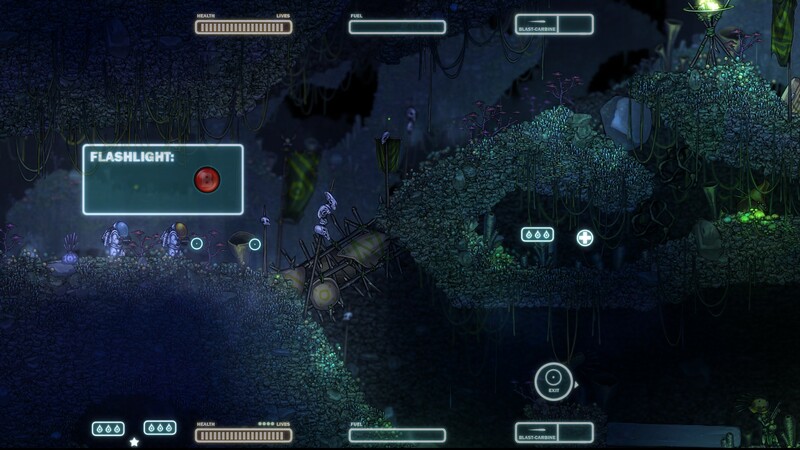 This is not a MetroidVania game. I want you to take that sentence, hold it, examine it and understand it. If you were anything like me, the trailer gave you a heavy MetroidVania vibe and (besides the compelling visuals) is probably what piqued your curiosity. I issued that first sentence as a warning to those who begin to play Capsized with that in mind. When distilled: Capsized is actually an Action/physics Platformer with fantastic art direction. 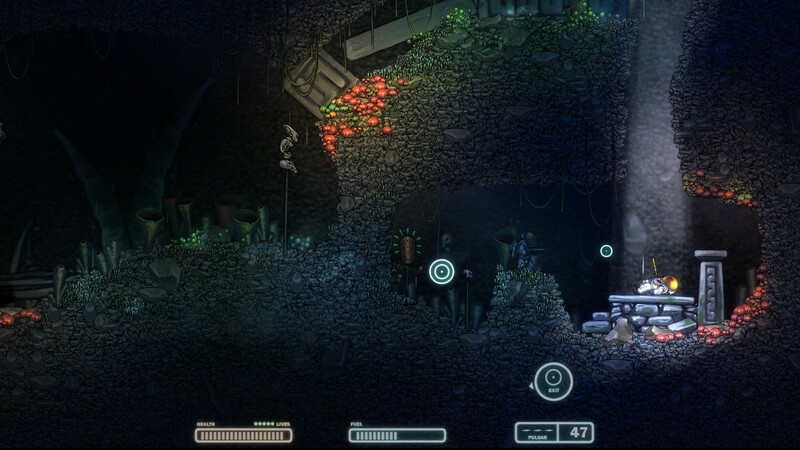 With just that approach in mind, it becomes a lot less about exploration and more about using your environment and the floaty physics to complete the levels objectives. Thankfully, you have two choices when it comes to controlling your character. Mouse and keyboard or Controller. Please note that the majority of my play time was with the Xbox 360 controller and 5.5 hours of playtime single-player and local multiplayer combined. For a brief moment I considered just plastering a bunch of screen shots and just leaving it at that. After all, pictures are worth a thousand words, right? It probably doesn’t do Capsized enough justice to leave it at that. Scratch that, it probably doesn’t do the *artist* enough just to leave it at that. The crazy amount of detail in Capsized is staggering and literally jaw dropping. 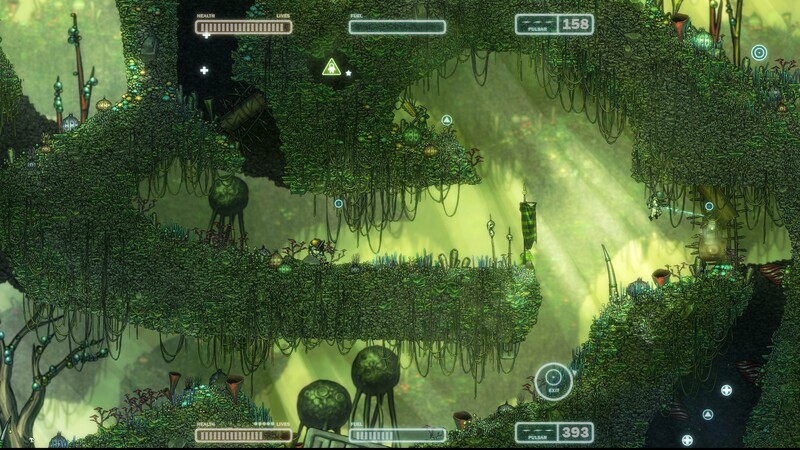 In one level, during the heat of battle I just stopped fighting to focus on the sprawling parallax background. 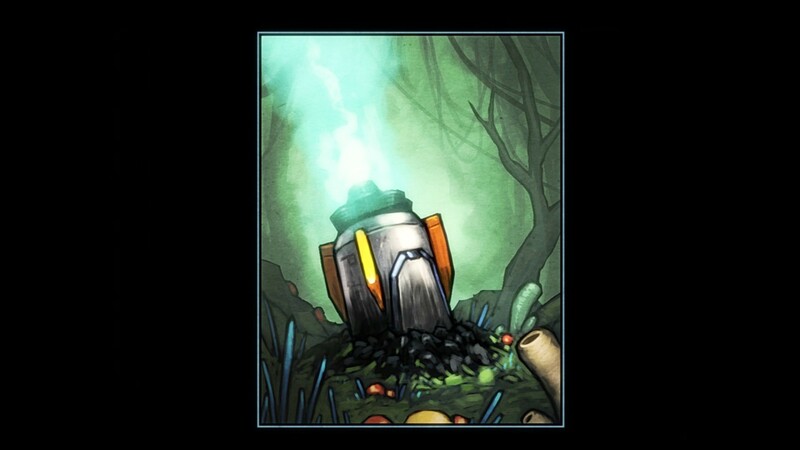 Another moment, before finishing a level featuring eternal blackness highlighted by what I can only suspect is irradiated fruit and reflections from moon beams, I take a moment of solace to look back on a fallen comrade. This is just an amazing sense of depth. 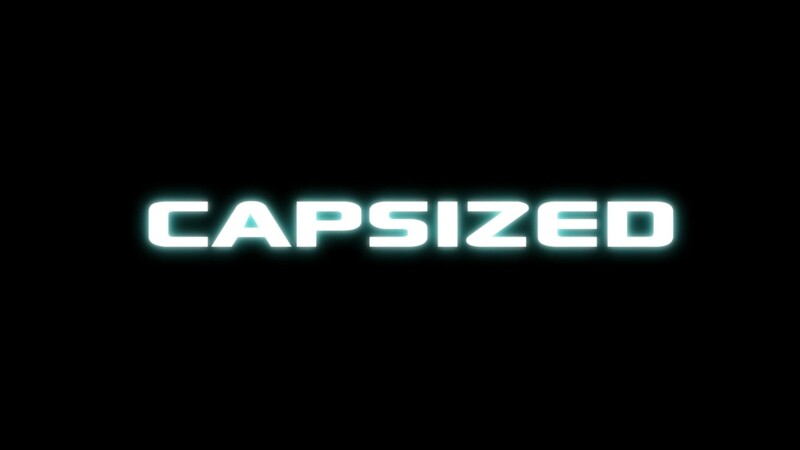 Capsized is a visual feast for your eyeballs. 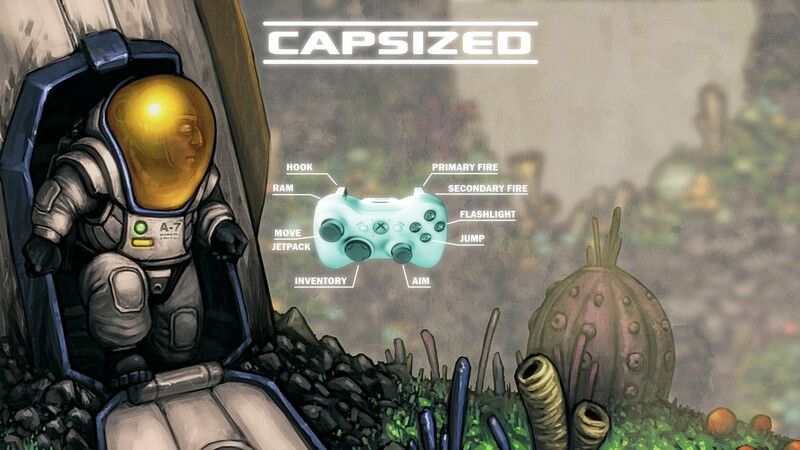 To the artist(s) who worked on Capsized, I applaud you for the painstaking detail you put in every nook and cranny. First, I’d recommend playing with a controller. It’s just my opinion, but moving around and grappling/ram jetting/jet packing just seems easier to maneuver with buttons and an analog stick. You have much greater fidelity with a mouse regarding aiming, but enemies don’t move around *too* much, so an analog stick for aiming ain’t too shabby. Having said that, there is an error on the controller screen, it lists ‘A’ to jump and ‘B’ to turn on your flashlight. ‘A’ doesn’t jump, instead you can just push up on the analog stick and ‘B’ doesn’t turn on your flashlight, but ‘X’ does. I’m sure this is a quick fix, but it had me believe that I was supposed to find batteries or some type of power source for my flash light, not that I had been informed of the wrong button to push. So the first cave level was a bit of a hassle :). Trust me. It's not the 'B' button. The first five levels act as a tutorial of sorts. Slowly introducing you to different aspects of the game and letting you adjust to the control and the floaty physics of objects. Between the hook shot and the ram jet, they serve as two of the best tools in your arsenal and oddly enough small objects that you grapple onto can let you perform a maneuver I like to call “infini-jumping” in which you hook on to an object and while it’s beneath you jump up. The Object will travel faster than you jumping which will allow you to propel yourself into the air indefinitely. By far the ram jet has to be the most satisfying tool to use. There is a clear sense of impact and amount of propulsion built into the ram jet. All weapons have two fire modes, but what it boils down to mostly is either rapid fire or bulk shot. The only difference being the immolation weapon whose secondary fire is a repelling wave that deflects all incoming projectiles. Unfortunately, on a gamepad switching to an fro weapons isn’t as easy as it is on the keyboard, but that just comes with the territory. Mechanics aside, I really recommend the local co-op play if you can arrange it. While the single player form of the game managed to have a form of mystery shrouded over what you are doing (helped largely by the art direction and hindered by the floaty/goofy physics) the co-op side of the game takes on an extremely fun arcade type of feeling. Barrel-assing through the levels, tag team hook shots/ram jets plus the assortment of varied arsenal you acquire during your travels, is a mine filled with fun waiting to be harvested. Two word review: Disturbingly Appropriate. Another nod needs to be given for balancing the art direction so well with the sound track for Capsized. Likewise, the sound effects seem to have been carefully thought out. From crashing foliage to the sound of the rail gun, everything seems to have been considered to fully flesh out the world of Capsized, to the point it’s very realistic. 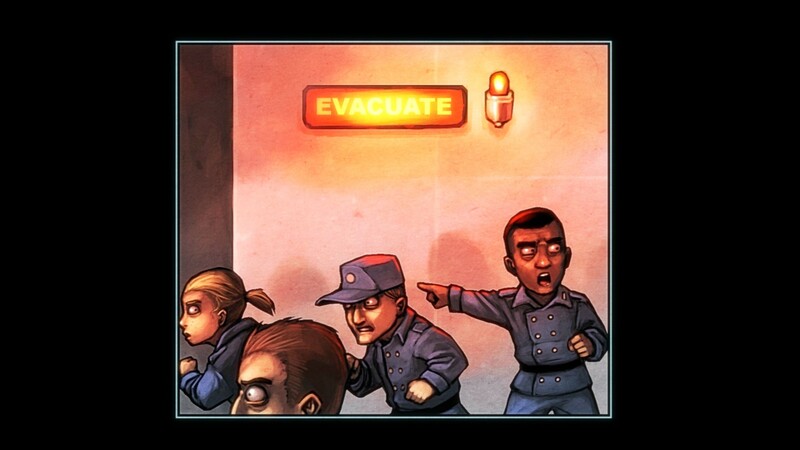 While I appreciate the audio cues are given to pretty much every action carried out within Capsized, I have to say that the audible grunt your character makes when jumping heavily detracts from the sense of intrigue and curiosity brought forth from the strange planet you find yourself on. At certain points, “hOOP” and “hUP” (the sounds your character makes when jumping) acts as sound pollution and rips the mood right out of the game. Think about what this sounds like. The story communicates itself to you via a set of comic strips. The intro shows a shuttle being hit by a green meteor which forces the shuttle to evacuate and ultimately your escape pod crash landing on the nearest planet. You set out to find your crew mates, salvage some parts, power sources and hope to get off this crazy rock. The only thing impeding you from leaving the planet is a mystical alien tribe and pretty much all other organic life hell bent on killing you. One might ask why they want to kill you so badly and why this deceptively primitive people have certain technologies built exclusively to hinder your progress? From having to rearrange my initial expectations, getting whiplash from the single player campaign’s inability to keep the magic and meandering yet beautiful level design, Capsized has some flaws. 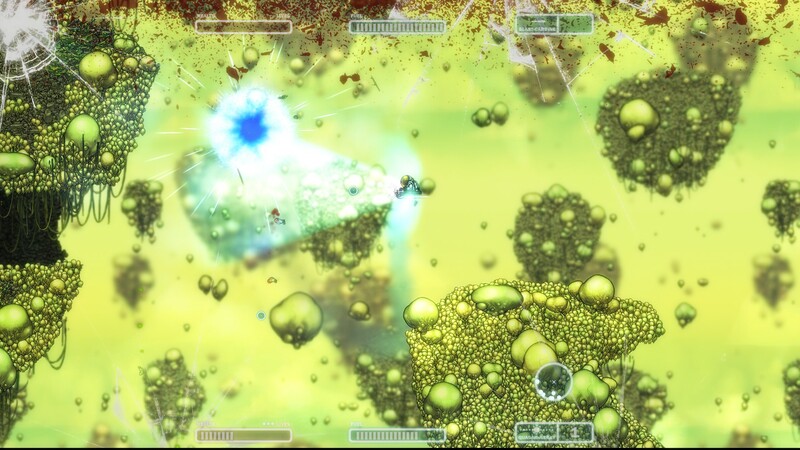 The floaty physics is almost a polar opposite to the rest of the game. Because I am fully equipped, the terrain doesn’t pose as any obstacle to me, there is an underlying flow to the level design but it could have been much more. The levels where you have to hook on to objects allows your jet packs to recharge automatically, whereas every other level you need to get fuel for it with seemingly no explanation as to why this is. The single player campaign by far was the biggest let down for me with Capsized. It’s fun, but it could have been exceptionally better and I feel as if there was a missed opportunity. Having said that, the co-op experience is my preferred method of playing Capsized and it’s just clear cut fun, which is all that matters. The only question I have for co-op is, why is the option to turn co-op on tucked in the options menu? 82/100: Lacking Single Player Is Fully Redeemed By Awesome Co-op.